A pump. The pump weighs 1 to 2 pounds (0.5 to 1 kilogram). It is placed inside or outside of your belly. Batteries or another power source. The batteries are carried outside your body. They are connected to the pump with a cable that goes into your belly. If you are having an implanted VAD placed, you will need general anesthesia. This will make you sleep and be pain-free during the procedure. The VAD will take blood from your ventricle (one of the main pumping chambers of the heart) through the tube that leads to the pump. Then the device will pump the blood back out to one of your arteries and through your body. 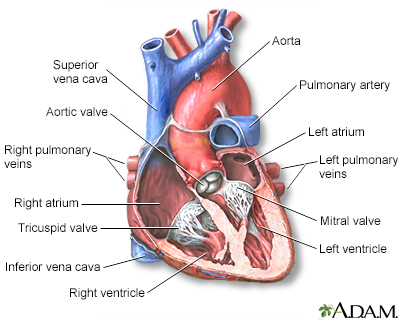 There are other types of VADs (called percutaneous ventricular assist devices) which can be placed with less invasive techniques to help the left or right ventricle. However, these typically cannot provide as much flow (support) as the surgically implanted ones. A VAD may help people who have heart failure live longer. It may also help improve patients' quality of life. Aaronson KD, Pagani FD. Mechanical circulatory support. In: Zipes DP, Libby P, Bonow RO, Mann DL, Tomaselli GF, Braunwald E, eds. Braunwald's Heart Disease: A Textbook of Cardiovascular Medicine. 11th ed. Philadelphia, PA: Elsevier; 2019:chap 29. Rihal CS, Naidu SS, Givetz MM, et al. 2015 SCAI/ACC/HFSA/STS clinical expert consensus statement on the use of percutaneous mechanical circulatory support devices in cardiovascular care: endorsed by the American Heart Association, the Cardiological Society of India, and Sociedad Latino Americana de Cardiologia Intervencion; affirmation of value by the Canadian Association of Interventional Cardiology-Association Canadienne de Cardiologie d'intervention. J Am Coll Cardiol. 2015;65(19):e7-e26. PMID: 25861963 www.ncbi.nlm.nih.gov/pubmed/25861963.